Pineapple upside down cake is always a hit. It looks pretty and everyone knows they are in for a taste treat. 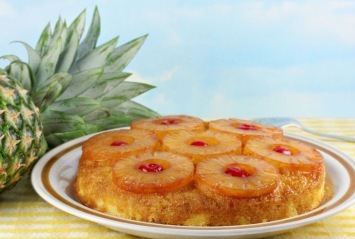 This recipe for pineapple upsidedown cake is quick and easy to make by hand. Melt butter in a 9" square pan. Stir in brown sugar and mix well in the pan. Arrange pineapple slices in the bottom of the pan. Place 1/2 a cherry in the middle of each pineapple ring. Drain the pineapple, reserving syrup. Add water to remaining syrup to make 1/2 cup. Cream together shortening and white sugar until light. Add egg and vanilla. Beat until fluffy. Add dry ingredients plus 1/2 cup reserved pineapple syrup. Beat until all is well mixed. Bake for 40 to 45 minutes. Cool for 5 minutes in the pan then invert the cake on to a plate. Great served warm with a dollop of whipped cream. For best results when making a cake, make sure your ingredients are at room temperature, especially things like milk, butter and eggs. There are just a few tricks to making a light and fluffy cake. Cake recipes usually ask that you “cream together” the sugar and butter. This just means mixing it well with a spoon or fork (I use the back of the fork to really grind the ingredients together). The secret to a light cake recipe is to cream the sugar and butter together really well, until it is very well mixed and light and fluffy. The mixing adds air to the batter and will ensure a light texture to the cake. Make this pineapple cake any day of the week for a sweet treat everyone will love. Pineapple upside down cake is just one of our wonderful easy dessert recipes. Find the rest here. The cake turned out perfect and everyone enjoyed it. Nice to have something old fashioned.